Modern day libraries are struggling with creating offers for children that will make particularly the next generation feel that it is both fun and natural for them to go to the library although all the knowledge in the world is now available online. The interactive learning tool, Hopspots, is with its games specifically targeted to children at the age of 3 to 15, but because you can programme your own content in the games Hopspots can actually be used by everyone. Hopspots contains 6 different games of which 5 of them are primarily targeted to younger children at the age of 3 or more. The Chase is a pure movement game, where players have to be fast in order to catch the red and green light that pop up on the spots. In Sequence players have to think carefully about their next move when they try to remember the order they built on the spots – because if they make a wrong step they have to start over! 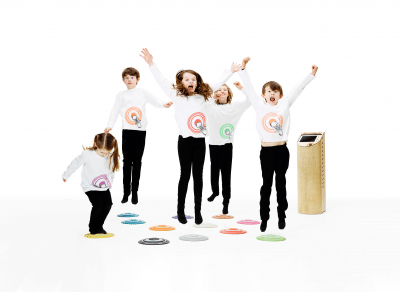 FlowDance is a music- and dance game, where children first record a piece of music by combining the different instruments on the spots. Afterwards, they can make a dance for the music by stepping on the spots in a way that they think fits the music. Lastly, they can challenge each other in a dance-off. At the library Hopspots can be used for a lot of different things be that events during school holidays, workshops across generations, workshops on making games based on books or authors at the library, creating your own stories in Code a Spot or quizzes about authors and their works in Mix’n’Match – the possibilities are endless. 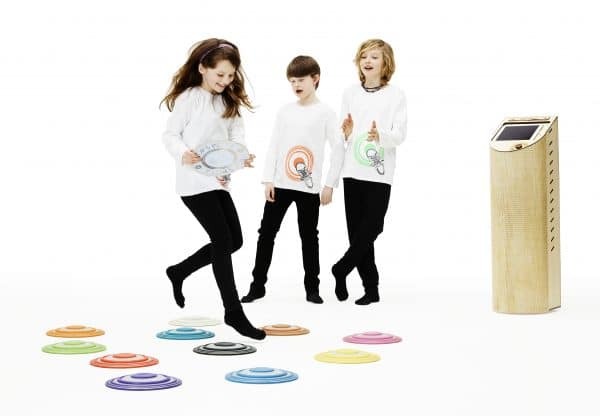 The Hopspots-games are designed to activate a large group of children either by dividing them into groups or by having everyone play together, depending on the number of children and their academic level. But, you can also easily play alone or together only a few people. You can also make your own games with Hopspots. That is done in Mix’n’Match or Code a Spot, where you can programme the content and thereby adapt the games to all ages and academic levels. It is simply done by recording content and taking photos for the games with the iPad’s record- and camera functions. Thus, making your own games is quick and easy. If you record your own content in Mix’n’Match you could for instance make a game for the library, where you have to match authors and their works on the physical spots. First, you step on a spot that says “Michael Bond” and then you have to fin the spot that says “A Bear called Paddington” to make a match. In the game, Code a Spot, you have the option to programme the content of every single spot. For instance, you can determine that the yellow spot should say “There once was a prince” when stepped on. That could be the beginning of a fairytale you make on the spots, where you record 12 parts of a story on the spots and programme their light. Afterwards, you distribute the spots randomly on the floor and it is then time to find the right order and lastly play the story to check if you found the right order. 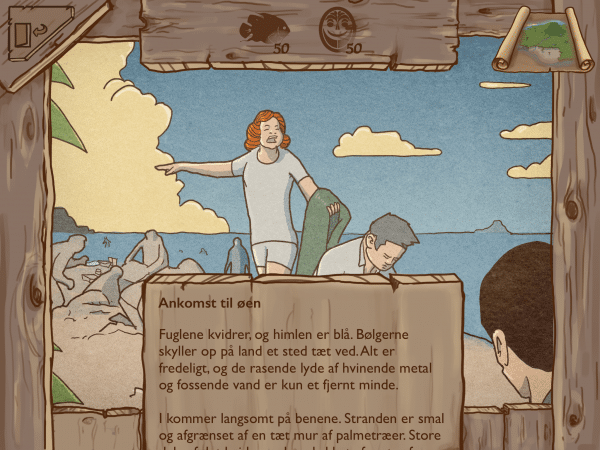 The Hopspots app also contains the interactive story, The Island, a game for the intermediate stage and lower secondary education. At the library you can for instance make a “The Island”-event during the winter-, summer- or whatever holiday, where the children have time for emerging themselves in the interesting interactive story together with other children or their families. The Island is a Robinsonade-game, where a group of children are stranded on a deserted island and have to figure out how to survive and eventually get off the island. The game consists of 3 chapters with each 12 dilemmas. The children have to discuss and come to an agreement on the dilemmas and now and then do physical collaboration exercises on Hopspots in order to collect food, improve the mood in the camp or explore the island – and hopefully survive the game. The sky is the limit when it comes to how you want to use Hopspots, and clearly it is up to the individual library to decide how Hopspots best fits in. Hopspots can for instance be placed in a permanent spot at the library, where everyone can access it, but it can also be facilitated by the staff at the library at specific events – or both. The Hopspots app is intuitive and easy to use for both adults and children, and as mentioned above there are 5 games in the Hopspots app, which are quick and easy to play. These 5 games take from 30 sec to 30 minutes or more to play, depending on how much time you have got – so try it out and have fun with movement, cognitive training, music, dance and so much more! Hopspots is designed with the fact in mind that children have no time or patience for problems with technology when they want to play and learn. Thus, we developed a product that is quick and easy to set up, and where the children can easily help the adults or even do it themselves. The physical spots have a wide range, the app is very user-friendly, allowing even young children to use it, and the speaker unit is easy to move around and use when you want to play, charge or store Hopspots.